2011 was a very rough year for US-listed Chinese companies, with numerous cases of fraud alleged and exposed by regulators and shareholders. Although many of the issues were concentrated in the “reverse takeover” area, problems in a small minority of companies spilled over to the large majority, damaging stock prices of many US-listed Chinese companies. Some of the questions raised about US-listed Chinese companies were real and some were only alleged, but many such companies responded inadequately to investor concerns about matters including complex or opaque ownership structures; questionable or unverifiable revenue sources; related-party transactions; questionable or non-existent assets; variances between US and Chinese filings; auditing issues; and much more. 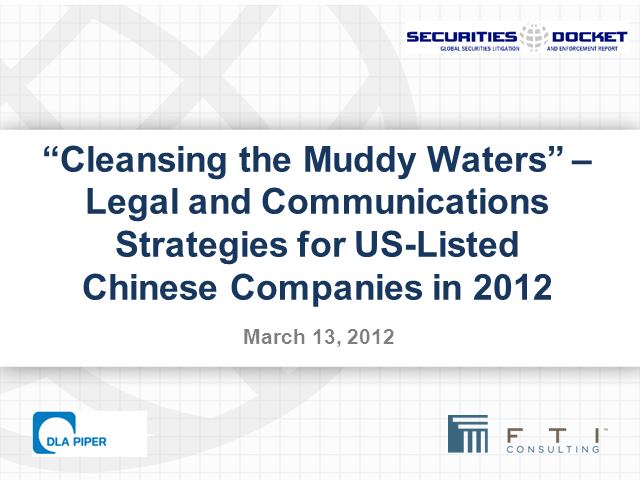 How can US-listed Chinese companies repair the reputational damage of the past in 2012? This webcast will discuss how these companies should replicate the rigorous due diligence process and IPO preparation that the “reverse takeover” companies circumvented to achieve both structural and reputational rehabilitation. US-listed Chinese companies, as well as those who invest in China or do business in China, will benefit from our panel’s expertise on what companies should be doing differently now following the turmoil in 2011. Please join Christine Beliveau and Gordon McCoun of FTI Consulting, and Patrick Hunnius of DLA Piper as they address these issues and your questions in a one-hour webcast.